Ancient China, Han Dynasty 202 B.C -. 220 BC. The Chinese Shar-Pei is a playful, active, dominant, and brave breed. It is very loyal to its handler. The Chinese Shar-Pei name roughly translates to “draping sand paper like skin” in Chinese where it was known as the “Chinese Fighting Dog”. In 1978 the Guinness Book of Records listed it as the world’s rarest dog. Today there is a renewed interest in Shar-Pei as a unique family pet. 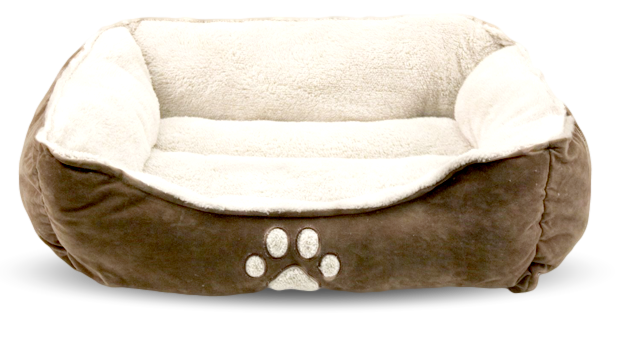 It is suited for both urban and city living, but it does not kennel well. 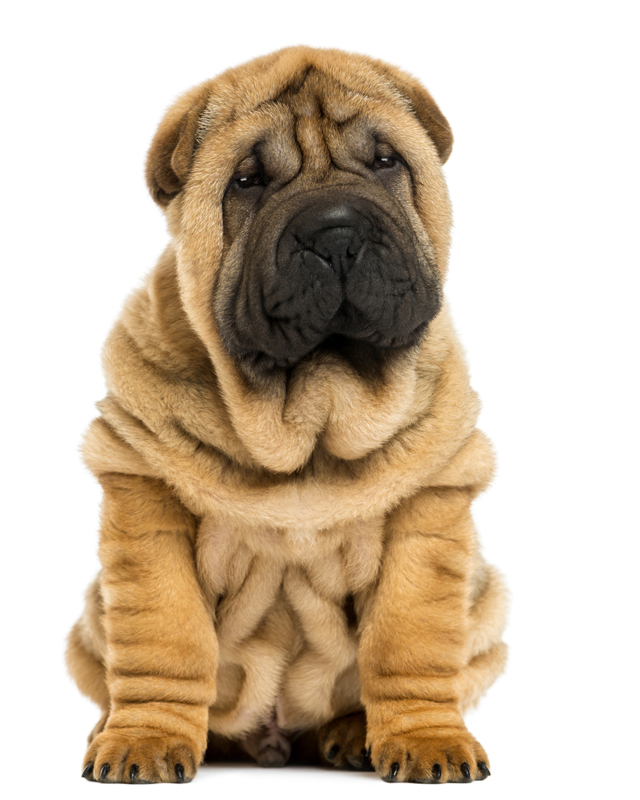 The Shar-Pei has wrinkled, loose skin. This is a well-mannered, friendly dog with an easygoing nature, but may show signs of aggression towards other dogs. The Shar-Pei has a blue-black tongue a characteristic only found in the Chow Chow and the Thai Ridgeback, which may suggest a common ancestry. 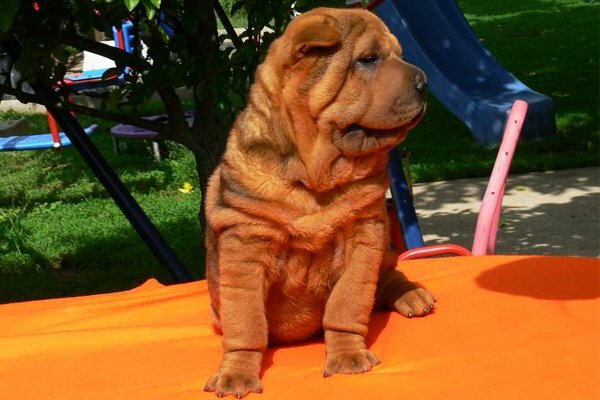 The Chinese Shar-Pei is easy-going, calm, independent, and devoted. 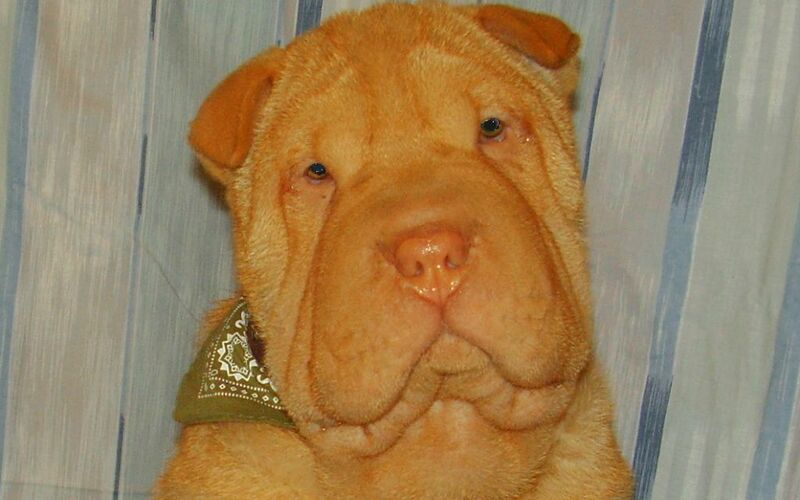 The Shar-Pei is an intelligent dog that does not always follow orders slavishly. 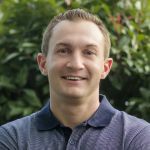 It needs a confident, experienced handler. This breed tends to be stubborn and bold; it needs firm, but gentle and extremely consistent training. If you are too uncertain, too inconstant, too soft, or too mild in the dog’s eyes, it will take over as the boss. It may refuse commands from family members who have not established leadership over the dog. It is bond with its family, but is not unfriendly toward strangers. It makes a very good guard-dog. 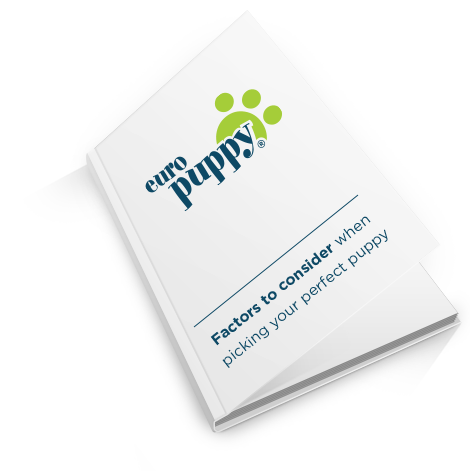 Mixing other dogs can sometimes be a problem; early socialization is a must. This dog is very clean and almost housebreak itself. 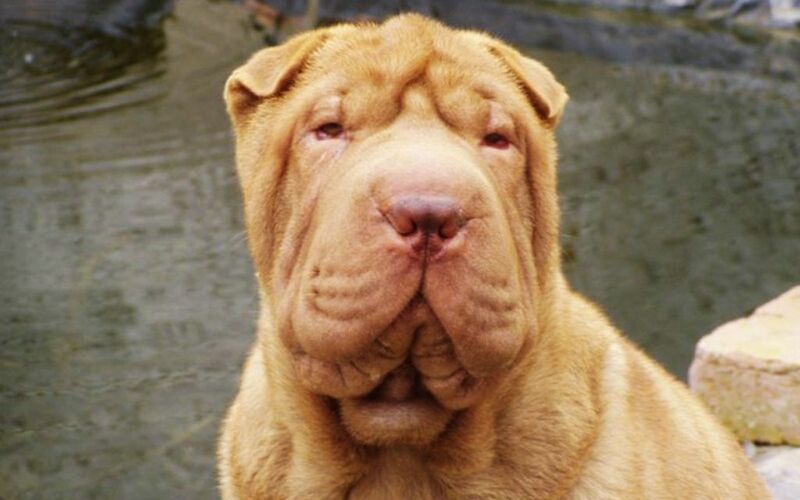 Shar-Pei dogs generally hate water and try as hard as possible to avoid it. Puppies grow very quickly and must be fed accordingly. The Shar-Pei tends to slobber, especially when in pain. 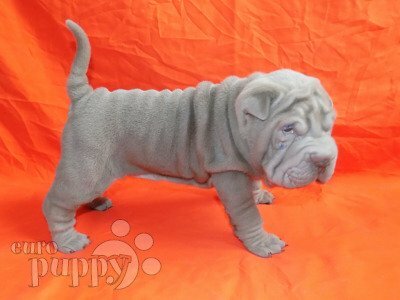 It is important to find a reputable breeder when seeking a Shar-Pei. A lot of this breeds personality and health depends on the lines it comes from. 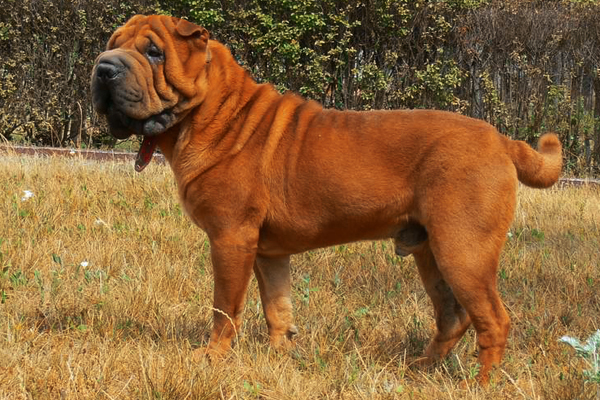 Good Shar-Pei lines will get along well with other dogs and will not have skin problems, which is a hereditary condition. Solid colors only, black, chocolate, reddish brown, red, light fawn, dark fawn or cream. Short, straight, bristly, no undercoat on loose skin. The Shar-Pei should be brushed regularly. Its coat is never trimmed. Attention must be paid to its skin to ensure that no irritations exist within the folds. Regular massaging and brushing and with a bristle brush will keep the coat in top condition. They can suffer skin problems (may be caused by hereditary condition), in-turned eyelids (entropion) and allergies, any signs of these must be reported to a vet. 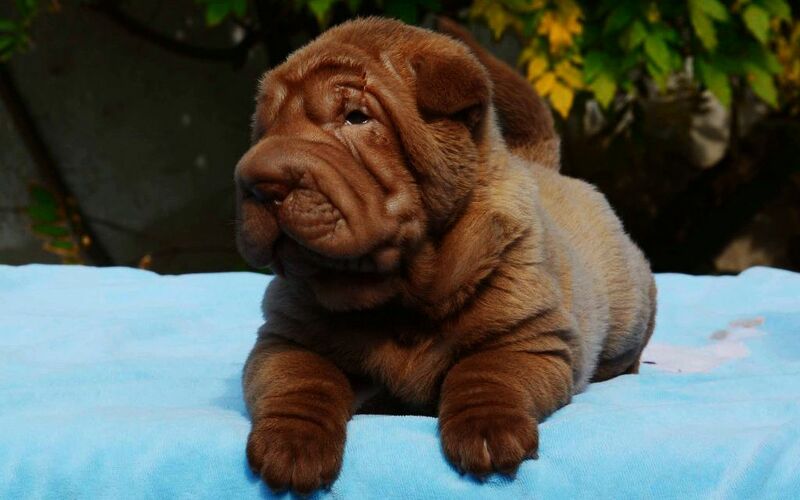 To minimize the risk of your Shar-Pei developing any hereditary health issues, you should buy a Shar-Pei puppy from a reputable breeder. The Shar-Pei will do okay in an apartment if it is sufficiently exercised. It is moderately active indoors and will do okay without a yard. Because of its padded head, it is very sensitive to heat; shade and water must always be available. Provided it gets enough exercise, it will be very peaceful indoors. Shar-Pei has a considerable need for exercise, but do not over exercise it in the heat, as it is sensitive to it. 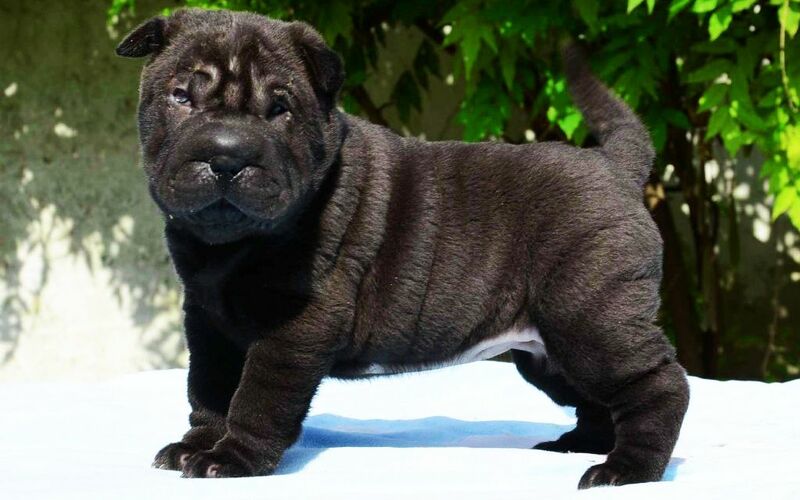 I consent to receive Notifications when new Shar Pei Chino puppies are posted.